Phil Bardsley is still open to the prospect of staying at Sunderland next season – and remains in discussions with the Black Cats hierarchy about a new deal. Gus Poyet had seemed to slam the door shut on the prospect of the Scotland right-back signing a contract extension by asserting that Bardsley had rejected a new deal a fortnight ago, but The Journal understands the situation is far from cut and dried. Although the club and player have failed to reach an agreement, both have agreed on further talks at the end of the season when the Cats know which division they will be playing in. And sources close to the defender insist that he has never told Sunderland that he will not return to Wearside next season. Poyet revealed earlier this month that Jack Colback and Bardsley would be leaving in the close season and while the midfielder has informed Sunderland of his intention to leave, their longest-serving player has not made a decision on his future. Indeed the last round of talks with sporting director Lee Congerton were believed to have brought the two clubs closer to a resolution. Bardsley has attracted interest from Fulham and West Ham and with his contract up at the end of the season he will have the option to remain in the Premier League – whatever deal Sunderland offer him. But the player is keen to stay in the North East and has enjoyed working under Gus Poyet, who brought him in from the cold after Paolo Di Canio suggested that he would never play for the club again. Bardsley is back from suspension but is unlikely to usurp Santiago Vergini for Sunday’s huge game with Cardiff City at the Stadium of Light. The Argentinian has been impressive in the last two matches and will be part of an unchanged side for the relegation six-pointer against the Bluebirds. 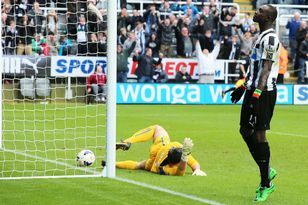 Bardsley was an unlikely contender for Sunderland’s player of the season award, which was won by goalkeeper Vito Mannone. The Italian has been one of the few unmitigated successes of a season that has veered between spectacular and pitiful with alarming regularity but he has rarely put a foot wrong and was the hero in the club’s Capital One Cup semi-final defeat of Manchester United. “I hope we can stay up because from where we were, we deserve it, even if we have made some mistakes in games,” he said. “In general, we started from October- November to realise what we could do after the gaffer came in. “We showed it in the cup run, showed it in some big games. It’s in our hands again and we need to show it again against the small clubs. Meanwhile, Alfred N’Diaye has hinted that he will remain in Spain next season – whatever happens to Sunderland. The 24-year-old signed a three-and-a-half year contract with the Black Cats last January but has been on loan at Real Betis since the turn of the year. And he has suggested that he would be keen to turn that into a permanent move if the two clubs can come to an agreement. “I really do not know if I will stay, it’s something you have to talk to the clubs about because I have not heard anything,” he said. “I belong to Sunderland and those teams have to reach an agreement first because my contract is there. I do not know what will happen next year, if I will continue in England or Spain.